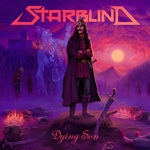 Starblind are a heavy metal band from Sweden formed in 2013 who released their debut album in 2014 and the follow-up in 2015. From the opening strains of 'A Dying Son' you may be forgiven for thinking you are listening to an Iron Maiden album, as Starblind are very heavily influenced by the eighties sound of Iron Maiden and other bands from the NWOBHM era. With a blazing twin guitar attack and galloping rhythms, 'A Dying Son' is a blistering opening salvo. The pace and power of the opening song continues with 'Blood Red Skies' all duelling guitars and catchy and infectious rhythms with a strong vocal performance, vocals that at times soar and scream. Epic and majestic, the seven minute plus 'Firestone' will have you time travelling back to the eighties and if you close your eyes you may just believe it too. With its galloping rhythms it smacks of NWOBHM, and head banging is a must here. Whilst the vocalist is no Bruce Dickinson (lead singer of British metal giants Iron Maiden), he does produce some spectacular, operatic style vocal performances with the occasional "scream" made famous by Bruce Dickinson. I'm really gonna have to stop with the Iron Maiden references, but the opening riff for 'The Man Of The Crowd' is clearly biased towards the British legends. Take nothing away from the musicians, yes there is an influence but they still play with skill and brilliance to produce straight forward, no nonsense, heavy metal. 'The Lighthouse' is a short, balls to the walls blast of head bangingly infectious traditional heavy metal. Although the band hail from Sweden, there is much more of an influence from the British shores than there is from the mainland of Europe. No European style power metal here, just pure unadulterated heavy metal. 'Sacrifice' has one of those widdly guitar intros, over layed with soulful vocals before the guitars come crashing in and beat the hell out of you with their ferocity. The intriguingly titled 'Room 101' is an up tempo, blistering and galloping slab of out and out heavy metal, with an infectious and catchy chorus. With pace and power 'Room 101' is one of those rare songs that is heavy metal to the core, yet light enough to appeal the hard rock fans too and bring a smile to the faces of the legions of followers that Starblind have. Ending an album with an epic eleven minute opus with a long title is a trademark associated with Iron Maiden (yes, another reference to the British stalwarts) and Starblind carry it off here with spectacular results. 'The Land Of Seven Rivers Beyond The Sea' has everything from blistering guitars to screaming vocals, thunderous drums to a galloping bass line and that all important x factor ... a catchy and infectious vibe that is guaranteed to make you head bang. 'The Land Of Seven Rivers Beyond The Sea' is a sparkling end to a romp through an eighties sounding, NWOBHM, traditional metal vibe of an album. Overall, heavily influenced by the eighties NWOBHM evolution, this is an album packed full of classic sounding, traditional heavy metal.